Bamleshwari Temple at Dongargarh in Chhattisgarh is an important Mother Goddess Shakti Temple in the region. The temple attracts devotees from Maharashtra, Telangana, Orissa, Jharkhand and Madhya Pradesh. The temple is around 110 km from Raipur. 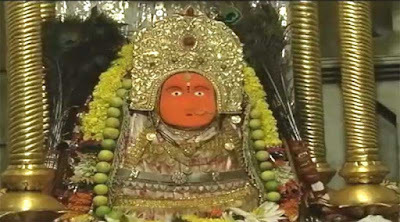 There are two Maa Bamleshwari Temple in Dongargarh. The most famous temple is known as Badi Bamleshwari and it is located on a hilltop at an altitude of 1600 feet. Once to climb 1100 steps or use the ropeway to reach the temple. The main murti of Bamleshwari worshipped here is a swayambhu pindi – that which appeared on its own. The murti is a red colored pindi (sindhoor color) with prominent eyes and crown. The other temple is known as Choti Bamleshwari and it is located on the foothills of the big temple. Scholars are of the view that the original name of the temple was Bagalamukhi and it later came to be known as Maa Bamlai and Bamleshwari. The popular belief is that Maa Bamleshwari blesses devotees with victory over enemies. Desires are fulfilled and problems in life are solved after praying here. During Chaitra Navratri and Ashwin Navratri, the temple attracts thousands of devotees daily.